PPE can include a variety of items including respirators, coveralls, and safety glasses, but in today’s post, we’re going to focus on one particular PPE item: gloves. What Kinds of Gloves are Considered PPE by OSHA? Leather gloves provide protection against rough objects, chips, blows, sparks, and moderate heat, while canvas and metal mesh gloves offer similar, yet different, kinds of protection. Also, one major advantage to metal mesh gloves is that they provide protection against cuts and punctures. Fabric gloves and coated fabric gloves are usually made out of cotton and other materials and offer protection against abrasions, chafing, and more. While fabric gloves’ uses are limited to protection against slivers, dirt, and cuts, coated fabric gloves are more general-purpose in nature, are slip-resistant, and are designed for applications like handling wire and lab containers. These gloves are exactly what they sound like – gloves which are resistant to different kinds of harmful chemicals and liquids such as peroxides, rocket fuels, acids, gasoline, and caustics. Insulating rubber gloves – along with all other insulating products for electrical PPE – must meet specific standards, including being produced by a seamless process, being marketed as its specific class (Class 1, 2, 3, etc. )., and be capable of separately withstanding a specific a proof-test voltage after soaking for 16 hours. Omni International Corp. is proud to offer an array of nitrile, vinyl, and latex gloves which can be classified as PPE for several markets including jan/san, safety, and healthcare. 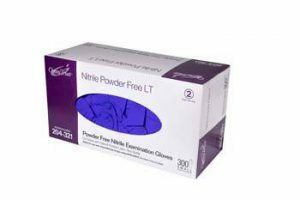 Omni’s nitrile gloves come in a variety of sizes, colors, and applications from powder free examination gloves to anti-microbial AMS multi-purpose gloves. Thinner than our 203 Series gloves, these gloves offer the “ultimate” in tactile sensitivity along with the strength you expect from our nitrile glove products. In addition, it is Chemo Rated for added protection from chemotherapy drugs, and its durability is proven in chemical resistance properties. Omni’s vinyl gloves are actually polyvinyl chloride (PVC) gloves. PVC is used as a latex substitute in many medical and industrial applications. Omni International Corp.’s new cast polyethylene (CPE) gloves – which are made of the plastic materials approved by OSHA – serve as a great alternative to vinyl gloves for industries like food service and food processing. 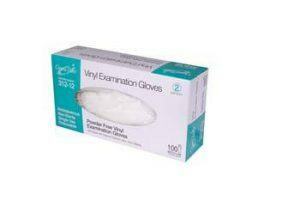 Omni’s latex glove selection includes multi-purpose options and powder free examination gloves. 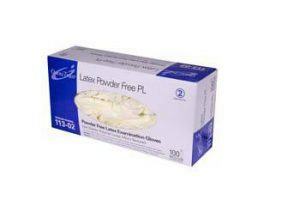 Our OmniTrust Latex Powder Free PL is a reduced protein glove. It has our famous micro-texture matte finish for added grip control without loss of tactile sensitivity. When it comes to choosing which PPE gloves to use, it’s important to analyze the properties of each glove you’re evaluating and how resistant each glove is against chemicals spanning from acetaldehyde to xylenes. As part of the glove evaluation process, we recommend that you test gloves before use. Glove suitability should be determined by the purchaser for each application or materials handled. To evaluate all of Omni’s gloves and determine which option is best for the industry (or industries) you serve, get in touch with us today!